Audio Technica ATH-ANC7B review | What Hi-Fi? As we sit in one of our testing rooms, headphones on head, clapping our hands and tapping various objects, we start to wonder where it all went wrong. But fear not, What Hi-fi? Sound and Vision's review team hasn't lost its marbles. 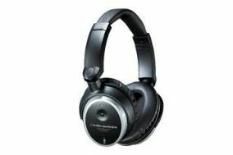 Rather, we're testing Audio-Technica's latest noise-cancelling headphones. One AAA battery powers the active noise-cancelling on the ATH-ANC7B headphones, which also come with two detachable 3.5mm headphone cables of differing lengths, an adapter for 6.3mm connections and a case. A switch allows you to turn the noise-cancelling on or off, though the difference in sound means we would have it on the whole time because, turned off, the headphones sound closed and small. That's not to say all our dreams are answered the second we flick the switch. Compared with the class-leading Sennheiser PXC450, the ATH-ANC7Bs lack dynamic discrimination, clarity and insight. Mayer Hawthorne's velvet tones are muffled and indistinct, while the overall soundstage is smaller and less open, while treble effects can sound bright and uncouth. They're comfortable, solidly put together, can carry a tune and successfully cancel outside noise, but for pure sound quality, you can do much better.